How ’bout Emanuel Macron? Remember how Leftists in America fawned all over the man? After Emmanuel Macron was elected president of France last year, defeating his far-right opponent Marine Le Pen of the National Front to become the youngest president in French history, prominent Democrats and moderates in America seemed almost euphoric about the centrist European politician and his meteoric rise. According to those who had long thrived under the status quo, Macron was just the type of politician that was needed in the Democratic Party to shake things up a bit. Another influential Democrat, MSNBC host Joy-Ann Reid, praised the French politician for finding “a way to thread the needle between far right and far left populism/socialism” with his “culturally liberal but economically pragmatic” agenda. She even joked on her show that Macron should run the United States government as well. Salon went on to report that Macron flopped. Of course, in calling Macron a bust, they had to tie the man to Trump. One year later, it has become even more evident that “radical centrism” is no answer for the West’s political crisis. Although some Democrats are still fawning over Macron (despite his futile bromance with President Trump), in France he is now nearly as unpopular as Trump is in the United States. After passing right-wing economic policies that go after workers and reduce taxes for the wealthy, Macron has been widely branded the “president of the rich,” and his approval rating has steadily declined, now hovering around 40 percent. Not surprisingly, a poll from Odexa found that 58 percent of French people have a negative opinion of Macron’s economic and fiscal policies, while 80 percent feel that his reforms mostly benefit business and the upper crust. Macron is a far cry from Trump. The man given credit for a “bromance”, recently accused Trump of being a racist. Macron resembles Barack Obama, only he doesn’t have Obama’s “blackness” to use as a crutch. Well it’s not terrorism that has France in the news. Not unless you consider terrorism a revolt of taxpaying Frenchmen. 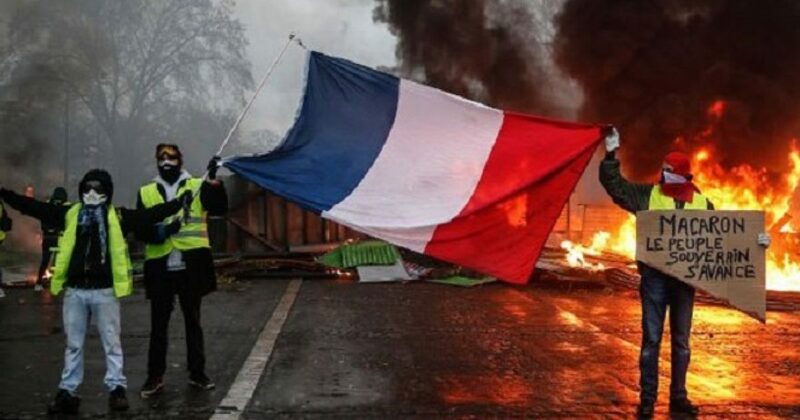 Protesters angry about rising taxes and the high cost of living clashed with French riot police. They closed off some of the city’s most popular tourist areas and fired tear gas and water cannon as they tried to quell the mayhem in the streets. At least 110 people were injured. Hmm. Rising taxes and the high cost of living? Sounds like France needs a real president. Like when America elected one on November 8, 2016. While Macron pretends to be about law and order–open borders notwithstanding–he’s no Trump when it comes to protecting the police. And as the tweet by Katie Hopkins suggests, the French police aren’t buying it. Paul Joseph Watson of InfoWars provides the numbers for those keeping score. 224 people arrested in Paris and 94 injured. Wow. How’s that globalism working out for you Macron? “We have to think about the measures that can be taken so that these incidents don’t happen again,” government spokeswoman Benjamin Griveaux told Europe 1 radio. The protests began as a backlash against Macron’s fuel tax hikes, but have mined a vein of deep dissatisfaction felt towards the 40-year-old’s liberal economic reforms, which many voters feel favor the wealthy and big business. Again we get the cause as Macron’s “liberal economic reforms”. So what bothers you most? Fuel costs that affect your ability to get to work? Or some obscure idea that the rich benefit from small cuts to some of the highest taxes in the world? These people riot because they are tired of paying $6 a gallon for gas. Further, they riot because they have fewer jobs, and more illegals who living off their efforts. This is exactly what President Trump avoids with his policies. In a final irony, leave it to James Woods to bring the issues of Europe home to America. And in a way even Leftists might actually get it.